America was changed when it was struck by the surprise attack at Pearl Harbor. Overnight, America went from having a non-interventionist policy to a declaration of war against Japan. The sleeping giant woke up and began to mobilize. The Pacific War began and America moved towards a new kind of enemy, one that they had never faced before. The Japanese forces were all over the Pacific, controlling several strategic points that allowed for them to conduct warfare and disrupt trade routes. The cluster of islands that the American military decided would be the first point of invasion were known as the Solomon Islands, and consisted of Guadalcanal, Tulagi and Florida Island. The Solomon’s were a suitable base for the Japanese because it gave them the capacity to stop trade movements from between Australia and the United States. With the American Navy beginning to turn things around, having achieved a critical victory at the Battle of Midway, it was time for America to go on the offensive. Their first stop? Guadalcanal. An airfield had been constructed by the Japanese, and that was one of the primary targets of the Invasion of Guadalcanal. The goal was simple: seize control of the island from the Japanese and secure the air field. The men who were sent into that territory were green, fresh soldiers who weren’t the most experienced nor well equipped. Their weapons were bolt action rifles and their ammunition was relatively low. For the Americans, this would be the first time they faced their Japanese foe on land. The conditions were abysmal. The island was hot and humid, full of mosquitos and not nearly supplied with enough natural resources to feed either side. Disease would quickly ravage the American soldiers, with as many as one out every five marines getting dysentery. It was a wretched, hot place and it would only get worse once the fighting began. The Japanese were cocky, believing that they were a superior force. They had won many a victory before against their foes in China and they viewed the Westerners as weak. Their belief that the Americans would fall before their might was quickly brought to an end when the Marines fought back with intensity. Yet, even for the Americans, the battles were horrifying and strange. The Japanese were unlike any other foe they had fought before, as the Japanese had very little fear of death. The Japanese government had worked hard to create a culture of honor in their military, creating the idea that death would be far more honorable than capture. This coupled with a great amount of lies about how savagely the Americans would treat a captured soldier, created for a very deadly foe. The Japanese soldiers would fight to the death, no matter what. They would not surrender, even when it was clear that they were going to die. 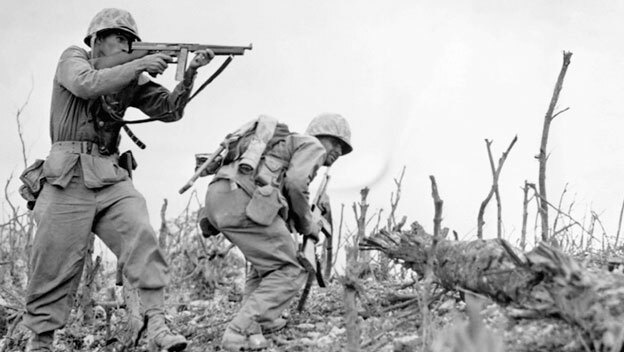 Rather than give up, they would often perform banzai charges, grouping up and charging enemy soldiers with their bayonets, choosing to get gunned down than surrender. To say that this was met with horror by the Americans was an understatement. The sheer tenacity that the Japanese fought with quickly showed the American soldiers that this was going to be a different kind of war. It was one that would be fought to the very last soldier. This meant that the casualty rate of the Japanese would be much higher than the American forces. From the American perspective, it was almost unconscionable that their enemies would fight so savagely, and this contributed directly to the American propaganda machine that stated that the Japanese were less than human. Both sides would grow to hate each other more and more as the war raged on. The Battle of Guadalcanal was one of the most crucial combined arms operation done by the Americans. The Navy, the Army and the Marines were present in the conflict, working to support each other. Naval bombings had ensured that the airfield would be clear of enemy presence and when Marine boots hit the ground, there was very little trouble taking it. The real struggle in this conflict would be in the months to come. With the airfield in control of the American military, they were quick to name it Henderson Airfield, after an aviator who had given his life for America. With the Japanese mechanics who had been working on the airfield driven off so quickly, there was plenty of material and tools left for continuing construction on the airfield. Repairs began at once and soon the airfield was operational enough for naval aircraft to land. The Japanese were not ones who were willing to let the airfield out of their control so willingly and instead gathered up their forces and tried to seize it back. Wave after wave of soldier would come at the American Marines, but they held their ground. No matter what, the Americans refused to let their enemy take it back. Nearly 6,000 Japanese soldiers were killed in the first serious attempt to rescue the base. Henderson Airfield would stay in Marine hands for the rest of the war. Tulagi and Florida Island had been secured at this point, leaving only Guadalcanal itself to be the major point of contention. The Japanese had quickly begun to send reinforcements to the island and a series of naval battles would determine who would be the winner in this conflict. With Japanese bombing runs successfully damaging Henderson field and destroying several American fighters, it was clear that this would be a battle of both land, sea and air. As the war between both sides became a game of naval dominance, the Japanese were able to devise a cunning method of transporting soldiers discreetly into the island of Guadalcanal. What they did was send their faster ships straight through a sound to under the cover of night. The ships were fast enough to move troops and supplies into the island and back to the naval base that they came from in a single night. This wouldn’t allow for heavy supplies to be brought with them, but was enough to smuggle fighters into the island to put pressure against the Marines. This transportation tactic was dubbed the Tokyo Express by the Americans. The cover of night would protect them from air attacks and would ensure that the fighting would continue for many more months. The air raids and sea battles continued, with both sides fighting endlessly until October, where a major Japanese offensive was being planned. Dubbed the Battle For Henderson Field, nearly 20,000 Japanese troops were prepared to launch an attack against the field. Using artillery strikes to convince the Americans that they were attacking from the west, the Japanese came from the south with several divisions, prepared to overrun the field. However, there was a breakdown in communication between the Japanese leaders and the troops, and the attack was launched a day early. The Japanese tank unit, moving toward the defensive perimeters at the Mantinaku river, was quickly obliterated by the American soldiers. The breakdown in communication cost the entire unit their tanks and many of the Japanese their lives. On October 24th, the major offensive began, but the Japanese were unable to punch through the American perimeters, being repelled wave after wave. It didn’t matter which direction the Japanese tried coming from, the American military was just too well dug in. Only a few units were able to breach the perimeter, but were quickly killed before they had a chance to reach Henderson. The attack was a disaster for the Japanese, with them losing somewhere around 3,000 soldiers and their enemies only losing 80. The attack on Henderson was called off and the Japanese forces retreated. During the attack on Henderson, the Japanese navy had attempted to move their carriers into a strategic position, only to be met with by the US Navy’s carriers. The Battle of the Santa Cruz Islands began and the air attacks were brutal. The Japanese were able to claim victory at this battle, forcing the American’s to retreat after sinking one of their carriers, but ultimately it was pyrrhic victory. The damage the Japanese carriers had sustained and the aircraft that they had lost was too much for them. They would be unable to support the island with the losses that they had sustained. By November, the Japanese were ready to try and retake the airfield, however it would require a significantly larger number of soldiers to achieve. Admiral Yamamoto decided that they would cease sneaking ships in and instead would try to handle things with naval superiority. The plan was to send reinforcements, heavy weapons and firepower to the island, accompanied by two battleships. This would be enough firepower to obliterate the airfield and allow for the Japanese to punch through the American defenses. The Americans had a different plan, however. Rear Admiral Daniel Callaghan chose to respond to the threat by sending his own forces to provide a counterattack to the fleet lead by Hiroaki Abe. The ships met in the middle of the night and were at a very close range. A melee erupted between the two sides with guns being fired and torpedoes launched. The Japanese were victorious in this affair, destroying the majority of the American response force and killing Callaghan. Yet, despite the victory, this spooked Rear Admiral Abe, who chose to pull back instead of pressing forward to bombard Henderson field. Yamamoto responded by relieving Abe of duty and putting a new commander in charge. The plan did not change: destroy Henderson field via naval artillery. With an exhausted fleet, the Americans didn’t have many options. If the attack were to happen at night, there would be no way to respond. All that remained in top condition were two battleships, however, the area in which they would be tasked with defending were very tight quarters. Naval doctrine explicitly made a point to disallow the use of battleships in such a small area. Yet, there wasn’t much else to do, so the two ships, the South Dakota and the Washington were dispatched to defend Henderson at all costs. Accompanying them would be four destroyers. The Second Naval Battle of Guadalcanal was a rough one. The small force was in position, waiting for the Japanese to arrive. Led by Nobutake Kondo, the Japanese warships moved into the line of sight and began to attack the American forces. Three destroyers were obliterated and one was heavily damaged. The South Dakota held longer, fighting back against the warships fiercely. What the Japanese hadn’t been counting on, however, was the Washington stealthily moving into position where they quickly opened fire on a Japanese battleship, blowing it to pieces with their artillery. The Washington was quick to flee after that, causing the Japanese to give chase, however they were unable to catch up with the American ship. Kondo called off the attempted barrage of Henderson field. Only 3,000 Japanese soldiers were able to be transported onto the island, as the daylight hours had made the transports an easy target for the airplanes. The deadlock continued for quite some time, until finally on December 12th, the Japanese Navy gave up and submitted an official request to abandon Guadalcanal. It was clear that they just wouldn’t be able to capture the island again. A secret evacuation was planned and took place over the next few months. By February 9th, the Americans realized that the Japanese had abandoned the mission and that Guadalcanal was theirs for good. This would be the first major victory that the Americans would achieve in the Pacific War and it would set the tone for the rest of their campaign. Rather than just press to mainland Japan, they would hop from island to island, overrunning the Japanese and securing each base until they were able to reach their final target: The Home Island. Despite the fact that it was a victory, there was still a lot to be learned for the American soldiers. They had not realized that their enemy would dig in so fiercely and dedicate themselves to a losing cause. They had not foreseen their foes turning what should have been a short campaign into a 6-month affair. Mistakes were made, lessons were learned but ultimately, this was the turning point in the Pacific War. The American engine was running now and it was ready to move full steam ahead.